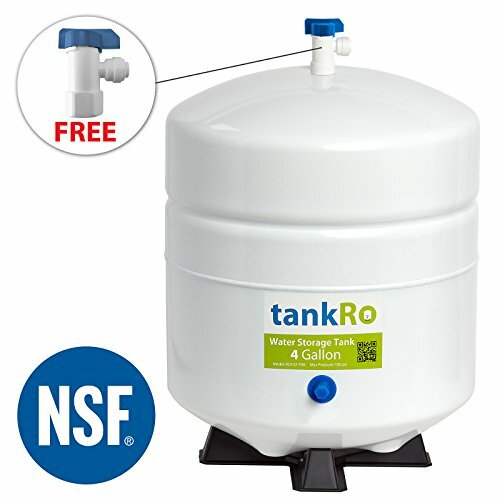 The tankRO 4 Gallon Water Storage Tank gives tasteless, odorless, and contaminant free water. Get a quality tank you can rely on today. The post cured diaphragm means sterile water distribution to keep your water safe. The water reservoir can hold up to 3.2 gallons of water at once, with the rest of the storage area being occupied by the pre pressurized air bladder, which helps you draw water from the tank. This tank comes with a free Tank Ball Valve and a free Tank Stand. All components are NSF Certified. Designed to fit under sinks this water holding tank will fit most kitchen cabinets, it is made to work when lying on its side or upright. The Tank is durability tested at several stages and is backed with a one year warranty. Maximum working pressure of the tank is 100 PSI. The tank is also designed to survive the outdoor elements with a two part epoxy primer and polyurethane paint finish. This is a fully functional pressure tank for water wells. The water accumulator chamber of the tank includes the highest grade of polypropylene, virgin polypropylene, meaning you have the most durable and smooth inside lining. This tank is built to last with heavy duty commercial construction with durable deep drawn steel domes and precision welded seams. Improve your water today. If you have any questions about this product by Express Water, contact us by completing and submitting the form below. If you are looking for a specif part number, please include it with your message.